Enjoyed getting to know Phyllis & Michael Roberts (TAPC & GTHC member) this morning during our Manistee River Trail hike. Unfortunately, a kayaker ran into a downed tree & lost her paddle, then the next tree, she flipped her kayak & climbed up on the tree branch, but lost her kayak, PFD & flipflops, so needed some major assistance. A backpacker & I climbed down the embankment to check on her, and then he tried to rescue her paddle from the tree but it was too far out in deep, fast water. Then, another backpacker loaned Barb (not a member of TAPC) some flipflops so she could hike 5 miles down to Red Bridge in her swimsuit. I tried to call a local friend of hers for a motor boat pick-up, but there was no cell service. 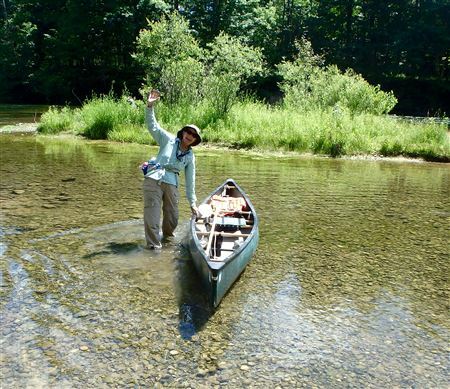 As we continued our hike upstream, I solicited some kayakers on shore to help get her kayak, etc if they could since it would take me 1 hr to finish our hike to Woodpecker Creek, and another hr before I could paddle down to her gear. By the time I got there, the paddle was gone, and no sight of Barb on the trail or at the take out. Others on the river told me a woman had passed by towing a kayak, so that was a relief. But, I never knew the outcome, though a fisherman at Red Bridge said a boat had gone upstream. I couldn't imagine that this woman could hike 5 miles since she was so overweight. Moral of the story, don't get left up the creek without your paddle & kayak, always wear your PFD, and wear sturdy river shoes, never flipflops. This is the 2nd rescue this wk on this fast section of the wide Manistee, which is almost unbelievable since there are so few obstacles! Don't forget the 7Ps: Proper Planning and Preparation Prevents Piss Poor Performance.